Yohance Humphrey, Chase Reynolds, Lex Hilliard … Dalton Sneed. Montana junior quarterback Dalton Sneed put his name amongst some of the greatest to ever carry a ball for the Grizzlies on Saturday, leading the Grizzlies to a 41-34 victory over a strong Sacramento State team with 206 rushing yards, 440 yards of total offense, and four touchdowns. Sneed set a new UM record for the most rushing yards by a quarterback in a game with his 206. The rare total is the eighth-best single-game rushing performance in program history, by any player, putting his name up there with legendary Griz running backs. 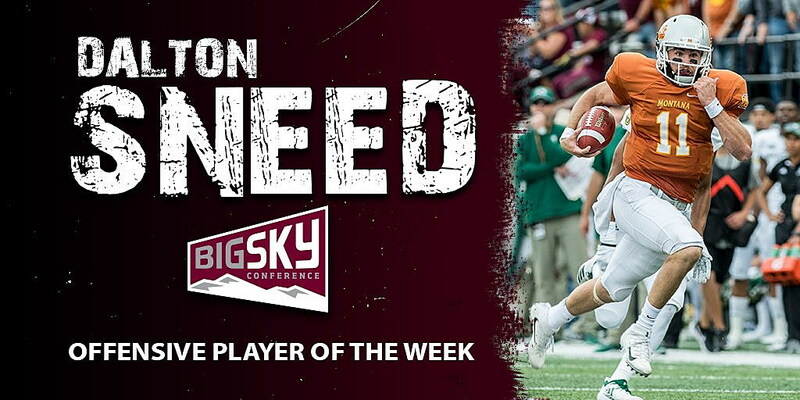 His 440 yards of offense was the most total production of anyone in the Big Sky Conference on week four, and as such, Sneed has been named the ROOT Sports Big Sky Offensive Player of the Week for the first time in his career. In racking up such an eye-popping number of rush yards, Sneed took off for a 75-yard touchdown, tying him at No. 11 on UM’s all-time longest TD runs list with Jody Farmer, who had a 75-yarder at Northern Iowa in 1987. The last Grizzly to rush for over 200 yards in a game was Jordan Canada, who put up 211 yards at Southern Utah in 2014. The last Grizzly to rush for over 100 yards was also a quarterback, with Makena Simis rushing for 101 in a heroic performance against Northern Arizona in 2017. Sneed’s honor is the third for the Grizzlies over four weeks of play in 2018, with Dante Olson picking up back-to-back ROOT Sports Big Sky Defensive Player of the Week honors on weeks one and two. Sneed now leads the Big Sky in total offense, averaging 340 yards per game, and sits third in all of FCS football in total production. On Sunday, Sneed was also given an honorable mention for national FCS player of the week by the College Sports Performance Awards and was named Big Sky Offensive Player of the Week by College Sports Madness as well. Buss appeared to be back to his old self against Sac. State, posting three sacks (one of which halted a Hornet comeback attempt), 11 tackles, and a pass breakup. The PBU also stopped a Hornet drive that would have tied the game in the fourth quarter. His three sacks were the most of any player in the Big Sky on week four, and his eleven tackles were more than any player for Sac State. Semenza remained perfect on the season in field goals attempts, kicking a pair against Sac State from 25 and 24 yards out, and going 5-5 on PAT attempts. Semenza now leads the Big Sky in scoring by a kick, averaging 9.5 points per game. Early in the first quarter with Montana trailing 7-0, true freshman Gabe Sulser took a jet sweep around the right side and sprinted 53 yards for a touchdown to tie the game. It was his first career touch of the ball for the Grizzlies.